Is there a setting I've not found to use multiple processors during a backup? I did a search on this subject and I found one query posted 20 February 2015 3:44 AM no response. I'm backing up SSD to internal HD with Medium Compression Level and Intelligent Sector Copy settings. Of the six cores available, Core 0 is maxed out and 1 thru 5 are active, but just loafing along. I have other software that uses multiple cores under normal use. Using Win10 and Task Manager to monitor CPU performance w/Resource Monitor opened. Any info is appreciated. I don't know of a setting to do that, and it's possible that this simply isn't a type of workload that can easily be broken up into multiple threads, or at least wouldn't benefit much from being multi-threaded. 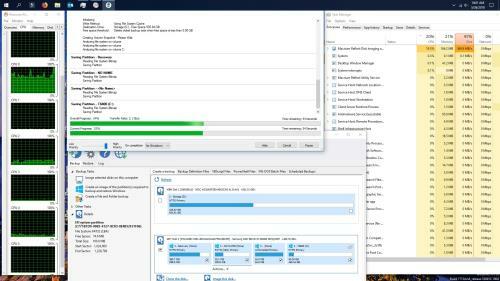 With clone, image, and F&F backup operations, the bottleneck is almost always the write speed of the destination (or the network link), and that would certainly be the case when backing up an SSD to an internal spinning drive, even with compression and/or encryption enabled. When you say Core 0 is maxed out, are you sure it's Reflect that's maxing it out? I've run clone and image operations from SSDs to hard drives with compression and encryption and have never seen huge CPU utilization like that, even on lower-end CPUs. Do you perhaps have any third-party anti-virus running that might be interfering with Reflect or trying to scan everything? Thank you so much for a prompt reply. I'm at present using Windows Defender as Anti-Virus software. No other processes of note are running. I've enclosed a screen shot of a backup in progress with Task Manager open w/Resource Monitor, if this is of any help. If there is anything else I can provide you, please let me know. Windows Defender is first-party anti-virus, so no issues there. Thinking about it more, I suppose I may never have noticed this since I may have been looking only at total CPU utilization rather than per-core, but as Task Manager is showing, your real bottleneck is still your disk, and if your destination is a spinning hard drive rather than an SSD, that 559 MB/s would be read speed off the source SSD. I suspect Reflect may be reading somewhat ahead and compressing, then waiting for the destination disk to catch up, since spinning disk write speeds normally top out around 120 MB/s. You would be able to see that if you go to Task Manager > Performance and check the listings for your disks. Again, it’s possible that Reflect simply isn’t multi-thread enabled for this operation, in which case it wouldn’t be possible to spread the load from Reflect out across your other cores; that’s something that an application has to support. Windows can’t just do that on its own. And if that’s the case, the reason could be that there simply wouldn’t be any benefit to multi-threading this operation. Macrium would have to confirm, but in the meantime, there’s no setting you’re missing, and your limiting factor is that your source disk read speed is much greater than your destination disk’s write speed. Out of interest I ran Reflect on my desktop PC, which has the now vintage i7 2600K (overclocked to 4.4 GHz), to check on core usage. Thanks for you prompt reply and the valuable information. I appreciate all your information and your time. I'd be remiss if I didn't mention just how pleased I am with Reflect. It is very fast and efficient. Again, thanks for your efforts on this issue.